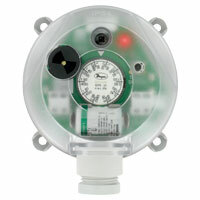 The Series EWDP Wireless Communication Adjustable Differential Pressure Switch uses EnOcean® wireless technology to monitor pressure, vacuum, and differential pressures. The dual scaled adjustment knob in inches of water column and pascals allows changes to the pressure set point to be made without a pressure gage. The battery-powered switch is equipped with radio module for frequencies of 902 MHz or 868 MHz which sends a signal wirelessly to a Series USB-300 receiver (sold separately) at each change of status. 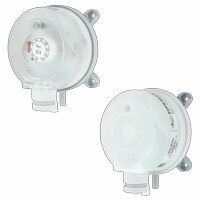 The silicone diaphragm makes this series ideal for use with air and other non-combustible gases. The EWDP is available with settings from 0.08 in w.c. (20 Pa) up to 20 in w.c. (5000 Pa). 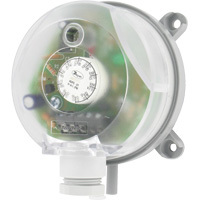 The compact size, adjustment knob, and wireless capabilities make the EWDP the perfect choice for HVAC applications in temporary installations or retrofits of existing buildings. Diaphragm material: Silicone; Housing material: POM; Switch Body: PA 6.6; Cover: Polystyrene. Process and Ambient: 14 to 158°F (-10 to 70°C); Storage: -40 to 185°F (-40 to 85°C). 40 in w.c. (10 kPa). (1) 3 V CR2032 lithium metal battery, installed nonfunctional, user replaceable (included).